Tuli’s Cheetahs were seen on athletes at the 2012 Olympics! Combine the shock absorption of Tuli's patented "waffle" design heel cups with the comfort and support of lightweight neoprene ankle support and you get unsurpassed support with amazing "barefoot" feeling and comfort. 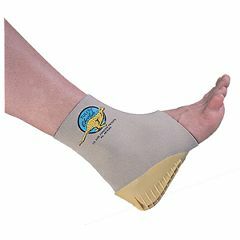 Tuli's Cheetahs are ideal for shin splints, tired and swollen ankles or just a little extra ankle support. A proven favorite of gymnasts and dancers world-wide, Tuli’s Cheetahs are perfect for athletes. Measure the circumference of instep (around the arch of the foot). Tuli’s Cheetahs ankle supports are also available in a One Size Fits Most version with adjustable hook-and-loop fastener(s) straps. Each package contains one Tuli Cheetah Ankle Support with Heel Cup. Easy Storage. Lightweight. Effective. Comfortable. Easy To Use. Safe. Good Value. Stabilizes. Exercising. Extra Support. Daily Use. Great for gymnasts. Effective. Lightweight. Comfortable. Good Value. My daughter plays soccer. She has suffered from Severs Heel for the last 3 years. At times it was almost impossible for her to walk. She had terrible pain during all her games and at times has to sit out. Ice and stretches didn't really help so I started looking for other options. I came across Tuli's Cheetah brace with heel cup a few weeks ago. She put the brace on and instantly could walk without pain! She cannot wear it with her soccer shoes (soccer shoes fit too tight), but she wears it all other times with her regular tennis shoes. She has been able to get through soccer practice and games with little or no pain. It has been a miracle worker for her! I am ordering another one since there are times both heels are hurting at once! A little bulky. Not much heel cushion. I had plantar faciitis surgery and 2 bone spur removal. still needed cushion 8 weeks post surgery thought this would provide help for barefoot walking but its uncomfortable on the inside. I use another tuli cushion inside this one. Not the answer I was looking for. Works well to lift heel. Lightweight. Easy Storage. Sturdy. Stabilizes. Good Value. I pre-measured my foot according to given chart but it was way too tight. I had to add two elastic strips to bring relief to my toes. I have a problem in my left ankle when I walk my foot pull out.do you have something to support this? it may be an odd question to ask but would any other gym parents know if its ok to take them to a meet? I have seen girls wearing them, so it should be fine. My daughter is 12 and smaller for her age. We bought the adjustable ones and they are perfect. I especially like them because she will be able to use them as she grows. I used the measurement chart and measured my daughter's arch as suggested. They fit perfectly based on that guide. how do I konw what size to buy? How do u wash them? I put them in the washer with regular detergent. They tend to get a bit smelly if worn as often as my girls wear them. Sometimes it takes a couple of washes to have them smell ok. I only air dry them. I have hand washed in mild detergent and air dried. They get pretty smelly with regular use! can you wear just one? or should you wear on both feet? You should wear them on both feet even if the pain is only on one side. Otherwise, the equilibrium will be thrown off, and something else will likely start to hurt as compensation occurs. We were told by our physical therapist it is better to wear both as there is a little elevation from the heel pad. Does the one size fits all have velcro to close it so it goes around the heel and ankle more like a shoe versus a sock? No, it is like a sock, and be careful... the one I ordered was too small even though I followed their guide to measure my ankle. It's now useless until one of my children (smaller) need an ankle brace. yOU HAVE TO PULL THEM on. its hard at first but you get used to it. You pull the brace on, but be careful... I measured my ankle as per their instructions and the brace was too small. Now it will wait until one of my children (smaller) need an ankle brace.